Free 1000 Barcode Numbers, Library template for Organizer Deluxe and Organizer Pro users. Database template includes 1000 barcode number. There are 3 additional database fields. You can use them for a library name, phone number, or address. Use this database to print barcode numbers. 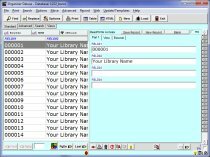 This database was requested by Small Library Organizer Pro users. use replace feature to define your library barcode numbers.